You may recall Divya Narendra, who co-founded Facebook competitor ConnectU, and has been embroiled in a lawsuit against Mark Zuckerberg and Facebook, and eventually settled the dispute (though according to reports this week, this may not be over). After graduating Harvard, Narendra worked as an associate at hedge fund Sowood Capital Management, where as an analyst he realized that the buy-side investment community was lacking a research-focused Wikipedia where users could share ideas and access data about hedge fund investments. Narendra teamed up with fellow Harvard alum and current hedge fund analyst Aalap Mahadevia, to fill this hole in the space. Enter SumZero, which is a community for buy-side investment professionals (which include hedge fund, private equity and mutual fund analysts) to share their research. A buy-side analyst generally performs research and makes recommendations on how well an investment will perform and align with a fund’s strategy. Generally, these recommendations and analysis are not available to other funds or outsiders. Until now. Soft launched last year, the site has accumulated over 3,500 hedge fund, private equity, and mutual fund analysts as members, including analysts from some of the most prominent funds- SAC, Blackstone, and KKR. A private network, SumZero allows analysts to apply to join the site, who are vetted to make sure they are legitimate professionals in the industry. Members can also invite other professionals in the industry. In order to access other buy-side investment professionals’ advice, analysts are required to submit ideas and research reports on the companies they are interested in buying or have bought stake in. 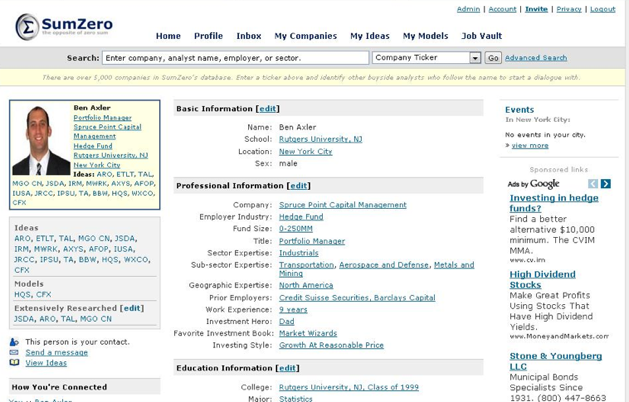 Similar to the LinkedIn model, each analyst has a profile that includes professional experience, educational information, and ideas submitted to the site. Currently, the network has accumulated over 2,000 detailed investment reports written by hedge fund, mutual fund, and private equity buyside professionals. While these reports are private within the network, SumZero is making one investment recommendation per week from its community available to the public. While the hedge fund industry has been notoriously closed and secretive with its investments tactics, SumZero is opening this world up to any user. Anyone can sign up to receive a weekly recommendation made by these analysts. For example, last week’s recommendation was for China MediaExpress, an advertising company in China. The rec was a 1000-word, detailed report outlining why the company should perform well. Here’s an example of a SumZero report, which was published on Morningstar. From the responses I’ve received from analysts and professionals using the site, it appears to be a hit in the buy-side investment community. SumZero member and investor Alan Axelrod finds the network as a valuable, daily resource for not only sharing investment ideas, but also to network and connect with other hedge fund and private equity analysts, sort of like a LinkedIn for the community. He also sees value in using the platform as a way to recruit other talent to his firm. Investment professional Jay Kilroy uses the site to receive critical feedback on investment ideas he has, finding that fellow analysts are willing to point out any flaws in a strategy. “It’s a great resource for idea generation,” says Kilroy, “And the level of transparency raises credibility of the site.” He echoes Alan’s feelings that the site is one of the more addictive web resources he’s seen on the web for buy-side investment professionals. In terms of competition, there’s the ValueInvestorsClub, which has a similar functionality. The main difference is that analysts can be anonymous and the site is much more exclusive with only 200 members. Narendra says that on the buy side, funds have never historically published their research, so the vast amount of high-quality research available on SumZero from hedge fund professionals is unprecedented in the community. Currently, Narendra says that the site is seeing five to ten investment ideas submitted per day. While the site is still growing, the scale it has achieved in a community that has traditionally been very secretive about their analysis and research is impressive to say the least. Of course, Narendra and Mahadevia both have hedge fund backgrounds, which gives the site more legitimacy. And there’s the question of a business model. Currently the team is evaluating what makes sense and declined to publicly state their strategy, but I can imagine there is a tremendous opportunity in terms of data availability.